A throwback to one of America’s staple 50’s dishes with loose origins from Russia. Ahhh, stroganoff. We fell in love with it in the 1950’s. Then bastardized it in the form of frozen dinners and cafeteria glop, making it one of the most underrated dishes today. 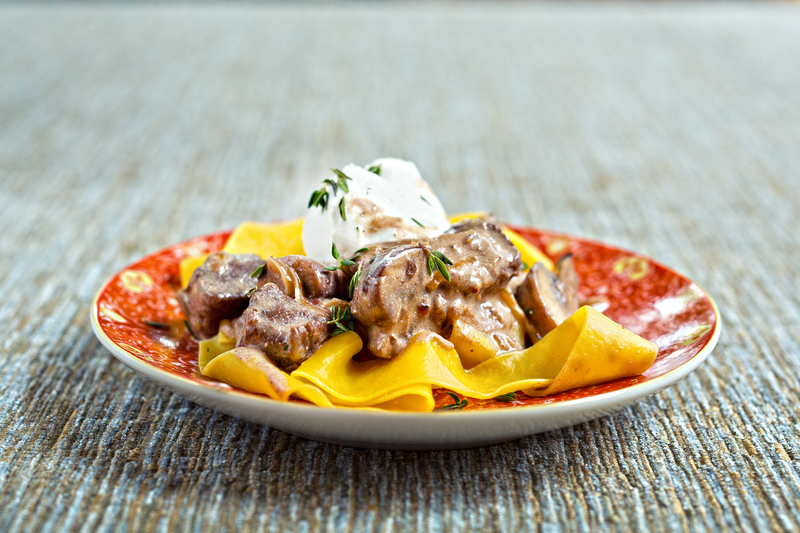 While it’s clear that stroganoff came from Russia, there seems to be a difference of opinion on the serving style. Around the food blogosphere, anybody that remembers this dish from a Russian relative or the country itself thinks you should only serve it with mashed potatoes. While this makes sense from a historical and cultural perspective… what? As often as I prefer to make something as close to its roots as possible, I straight up did not want to make mashed potatoes. Or eat mashed potatoes. I always envision stroganoff with beautiful ribbons of wide egg noodles. So let’s take a time-hop back to 1950’s America, shall we? 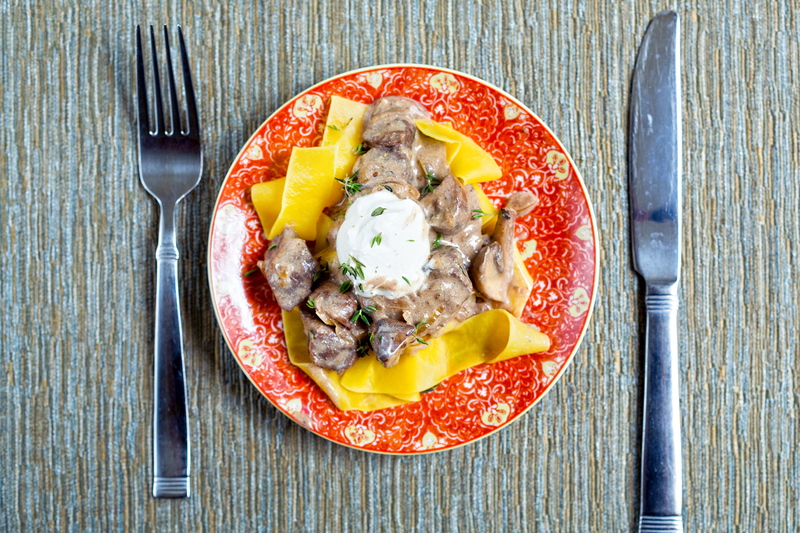 The beauty of stroganoff is that it’s kind of like a stew but without all the stewing. This makes it a pretty quick meal, even for a weeknight. As your meat/mushroom/gravy concoction is bubbling you can boil your pappardelle. (If you call it pappardelle it makes it fancier. You’re welcome.) In about 40 minutes or less you end up with a really comforting and filling dish. 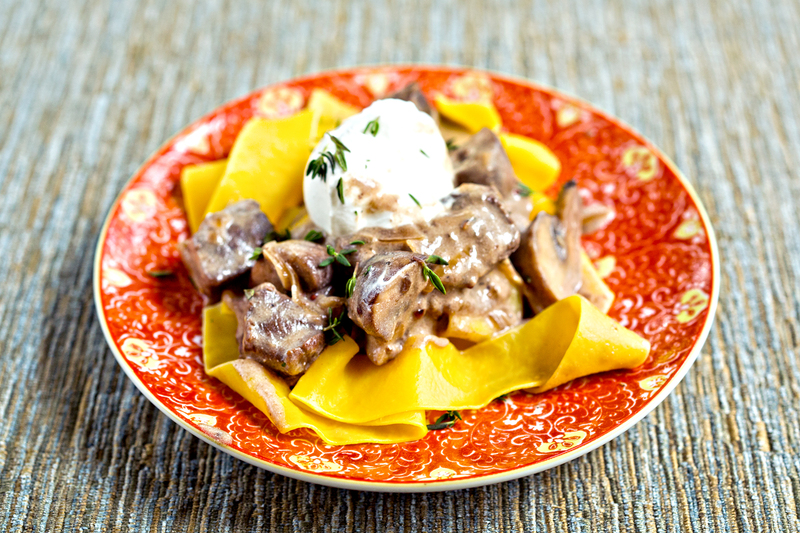 Since stroganoff has kind of garnered a reputation of “glop,” don’t skimp on this recipe. Use good mushrooms, quality pasta, etc. If you make it the way your grandmother would have made it, it won’t be gross. I promise. Ultimately, you’ll end up with a silky gravy wrapped around tender pieces of meat and mushrooms. Garnish with more sour cream and some chives and you end up with a really pretty dish, too. Melt 2 T butter in a skillet or large casserole over medium-high heat. Add the onions, mushrooms and a little salt. Sautée until the onions are soft and the mushrooms start to turn golden brown (10-12 minutes). Remove from pan and set aside. If the bottom of the pan is dry, add another tablespoon of butter. Add the cubed meat and sear. If it releases a lot of liquid, keep cooking on medium-high heat until the meat begins to sear and the bottom of the pan begins to brown. Deglaze the pan with the whiskey, (or broth if not using whiskey) letting the alcohol burn off for a minute. Add the broth, bay leaf, mustard, thyme and salt and pepper to taste. Simmer long enough for everything to meld together, about 10-ish minutes. If your meat is particularly tough, add a little extra broth and stew the meat until tender (up to an hour if you have the time). Once everything is done stewing, take off the heat and stir in the sour cream. Serve over egg noodles, rice, or mashed potatoes. 1 Comment on "(Not Really) From Russia, with Love"